Robb Woulfe, president and CEO of Breckenridge Creative Arts. When officials of the town of Breckenridge launched their search for a CEO of the new arts organization being formed in 2013, they may not have had any idea that, within a few years’ time, swathes of blue trees would highlight the downtown landscape. They may not have imagined a giant prehistoric-like “Saurus” roaming historic Main Street or fire-breathing sculptures lighting up the night in the Arts District. 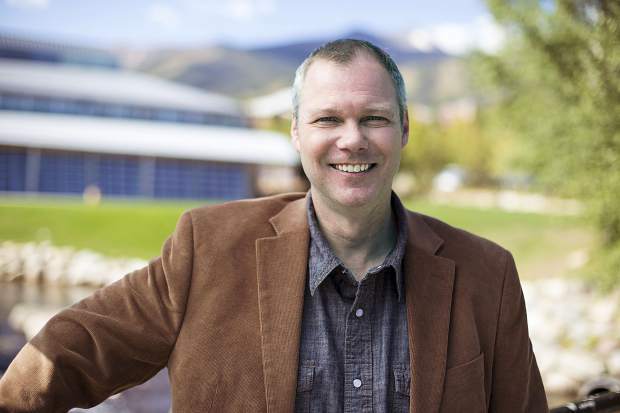 Enter Robb Woulfe, selected to be the first president and CEO of Breckenridge Creative Arts, the nonprofit founded in 2014 to enhance the town’s cultural and artistic profile. One might expect the job of CEO of a cultural organization to be different from the job of CEO, say, of a bank. Still, Woulfe has pushed the envelope, shaping the position into a high-octane mixture of business strategist and circus ringmaster. Woulfe moved to Breckenridge with his wife in 2014 after 10 years running the Ann Arbor Summer Festival. Within three years, he has put Breckenridge Creative Arts — BreckCreate — on the map, attracting a national and international audience to the 10-day Breckenridge International Festival of the Arts and winning the prestigious Colorado Governor’s Award for Outstanding Community Tourism Initiative. What kind of a person is able to combine a detailed knowledge of P&L sheets with the creativity to envision bold, large-scale productions that incorporate the unique mountain landscape — and personality — of Summit County? To find out, we talked to Robb Woulfe. Summit Daily News: Tell me about your background. What brought you to Breckenridge? Robb Woulfe: I started off as an actor and lived in New York City for many years. Eventually, I found I was better behind the casting table than in front of it; I was better as an arts producer than as an artist. But I have carried that experience of being an actor with me; I try to be sensitive to what the artist is going through. That started over 20 years ago. Eventually, I fell into performing arts management and festival management, and I spent the past decade in Ann Arbor, Michigan. Then I heard that this little town called Breckenridge was expanding its cultural profile. I realized I wanted to be part of something new, something exciting, a start-up. And I have always loved Colorado and the West. SDN: Your title is CEO. Yet there is a highly creative and inventive process going on in the manifestation of BreckCreate. How do you combine being a businessperson and a creative person? RW: I think of myself as a very creative person — I could dream up ideas all day. That is the fun part. But I am always very sensitive to cost, expense, infrastructure. And that is part of the game of making it happen. To me that is part of the adventure. It would be less exciting to spend all day coming up with art projects. The game is: How can I make the finances work? How can I bring international artists here? We have to be creative with all our resources. I love the yin and yang: coming up with the idea, then figuring out, how are we going to sell it, market it? How do we get buy-in? The thing I like about this community is that it has the tendency to attract adventurous spirits. If you are adventurous on the mountain, chances are you have adventurous artistic aesthetics. SDN: What challenges do you face now? RW: The challenge is related to having a unique identity. Is there an identity happening? Have we colored the community? We are not trying to be Aspen, Telluride, Steamboat. I think Breckenridge is now starting to find its own creative identity. Are we making a difference? I think we are, but then again this is what my team and I do every day. But for the Joe On The Street — has it really made a difference? I want the work to resonate. The work has to be relevant, it has to impact people. SDN: How would you know if it had? RW: I am a word-on-the-street guy. I watch the audience. That’s where I gauge our success. I see a lawn full of people and I can see we pulled an audience. That street response is really, really important. Mountain communities can be impatient — so the danger was to not do something big outside the gate. It was really important to me to start introducing festivals, new ways of doing things immediately. We have to keep people wanting to know what’s next. SDN: Outside of work, do you have a secret creative passion? RW: I am a festival junky. I love listening to music, going to festivals. I don’t think of it as work. I am always scouting talent, looking at what other people are doing, building my own network. The success of what we do is in collaboration. SDN: What do you do on a day off, to get away from it all? RW: Whenever we come off a big festival I just watch bad TV! I don’t want anything to do with arts and culture. SDN: What are one or two creative fantasies you might have for BreckCreate — things that you’d love to do that just seem impossible? RW: I never say impossible. I am a big dreamer. I was hired to manage facilities but I immediately fell in love with the river and the mountain and the trails. To me, those are the venues. I fantasize about doing something very large — with Lake Dillon maybe — using the environment, using this backdrop. We have millions of people coming here, looking for something to do. I have the audience, I have the canvas. And what I’ve found is that it is so much easier to attract artists — they are excited about working in this environment. I hope that we can keep doing these large projects, in the themes of wonder and awe. I want to keep doing things that are unexpected.